Single laser belt alignment system design. Single laser belt alignment systems are based on a straight-line measurement that hits two or three targets on a centerline. The targets are placed on the radius of the pulley and a line laser emits from the laser tool. This fan shaped line beam strikes the targets in the center target line of the opposing targets and when on all three center lines the system is said to be in alignment. 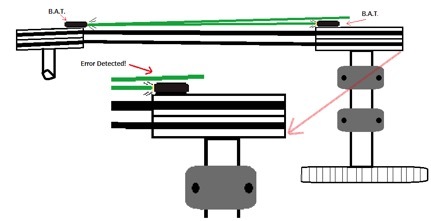 The errors of the single laser systems occur when the laser hits the targets at any distance and the laser beam widens, let’s say to 1/8” and the target line is 1/8th”, thus “spanning” the target line.It is very difficult to visually decipher if the laser line is actually on the target lines or just “bleeding” into or out of the target. Your system appears to be in alignment. But the sheaves can still be offset and angularly misaligned.This error can only be detected if you reverse the laser and targets and repeat the alignment process. And when this correction move is made you must then reverse the targets and laser to validate this measurement. And generally another move is required. This process may need to be repeated several times, especially on large or temperamental systems. This is very time consuming, costly and confusing to the technician. And as experience has seen, most mechanics do not reverse the laser and targets to validate the alignment, leaving the system in a compromised alignment state. The B.A.T. Belt Alignment Tool solves this inaccuracy of the single laser with dual crossfire lasers and GlowLine Targets built into the laser faces.This intuitive system allows the operator to easily see the result of the corrective move immediately. The green laser lines from the drive to driven pulleys are viewed on both GlowLine target surfaces. The alignment solution is instant and accurate the first time! There is no need to reverse and do another move, ever. d. Cocked or improperly installed taper locking mechanisms. e. Bent pulleys or bent sheaves. Using the round targets and the dual lasers you can examine the placement of drums and rollers on conveyor systems. Using the bull’s eye circular level you can do basic base and flatness checks. With the supplied mechanical dividers, minor offset alignment jobs up to .75” are easily solved. With the supplied mechanical dividers and optional offset targets offset alignment jobs up to 1.5” are easily solved. Easy Reliability: The Reliability Bonus of Accurate Laser Belt Alignment. Time is Money: The true cost of belt alignment. © 2018 Reliability Concepts. All Rights Reserved.